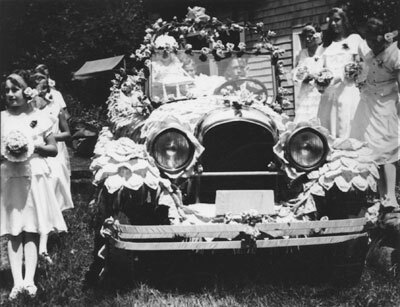 View looking at front of second May Queen Car, May 1932. Car is flanked by attendants. Scanned December 2011 using Epson Perfection V700 Photo at 300dpi and 100% of original image size. Alternate Versions: Lossless TIF from original scan at 300dpi and 100% of original print. W16 x H12 cm black & white print on photo paper.